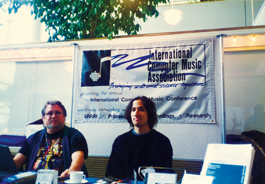 Strange Days: Composer Allen Strange and author Gary Singh at a computer music in Denmark in 1994. THROUGHOUT the nine years I spent at San Jose State University, nobody taught me how to control my voltage more than did Allen Strange, who passed away last week at the age of 64. He was a true sonic outlaw, which is precisely why we got along so well. One of the original pioneers of analog electronic music, Allen wrote the first textbook on that subject way back in the early '70s, long before synthesizers were ubiquitous. Even today, that book is a hoot to look through. Allen always taught us that composing a piece of music and cooking were exactly the same the process. He was probably the best composer of Mexican food that I ever knew. During all the years I invaded and occupied his office, there was never a shortage of Mexican food banter, fart jokes included. That was Allen: he could sit there over a double scotch and a Heineken and wax poetic about tortillas, briskets, chile peppers, lard and then, in the same breath, whether anybody should care about perfect authentic cadences. And when it came to food, Allen was a conductor. Whenever you were at the table with him—either at his house in Los Gatos or at a restaurant—he would always give his seal of approval by conducting if he thought the food was good. He would wave his arms in the air like he was right there at the podium leading the orchestra. That's how you knew that Allen enjoyed the grub. I still to this day find myself occasionally doing that and Allen Strange is where I got it from. In fact, before I even made it to the accredited university of SJSU, I was a teenager taking piano lessons with Brad Maiani in Allen's studio, circa 1988, which in those days was the back room of his house on Euclid Avenue in "Gatos," as we used to call it. The room sort of overlooked the creek in the back, and little did I know that years later we'd be sharing beers together and waiting for the peacock who occasionally showed up outside. Allen was the only person I'd ever met who would even consider philosophically analyzing the timbres and harmonics of peacock noises. I will always have a surreal lifelinelike connection to that house, not just for those piano lessons, but because I still have the Farfisa Compact Combo organ that Allen gave me years later. He was emptying out another room in the house—I don't even remember which one—and he gave me that machine. Quickly: a Farfisa was one of those immortal '60s, cheese-jangle-surf rock keyboards that have now deservedly achieved classic status. Allen's was originally one of the red models, except that someone somewhere—perhaps Allen, I don't know—had spray-painted it black and tried to hot-rod the electronics, and now it doesn't work at all. But I still own the thing and it still sits there in the room on the other side of the wall from where I grew up in my mom's house. I briefly got the thing to work a few times, but it's been broken ever since. And it weighs a ton. So I guess that's my umbilical cord to Allen Strange—that Farfisa keyboard—and for all the times I've stubbed my toe kicking the thing because it won't work, I guess I have Allen to thank for it. And he probably would have been proud to hear me say that. I will never get rid of that keyboard. First and foremost, Allen was a teacher and a friend. When my old group played a gig at the SJSU Student Union Holiday Faire in 1993 and emptied the whole building, resulting in the gig getting shut down, I'll always remember Allen flipping the bird at the Spartan Bookstore employee who had complained about the racket. At that time, I knew I had found my mentor. Long live Allen Strange.